Welcome to 1057 Queensway located in award winning Maple Leaf Golf & Country Club. 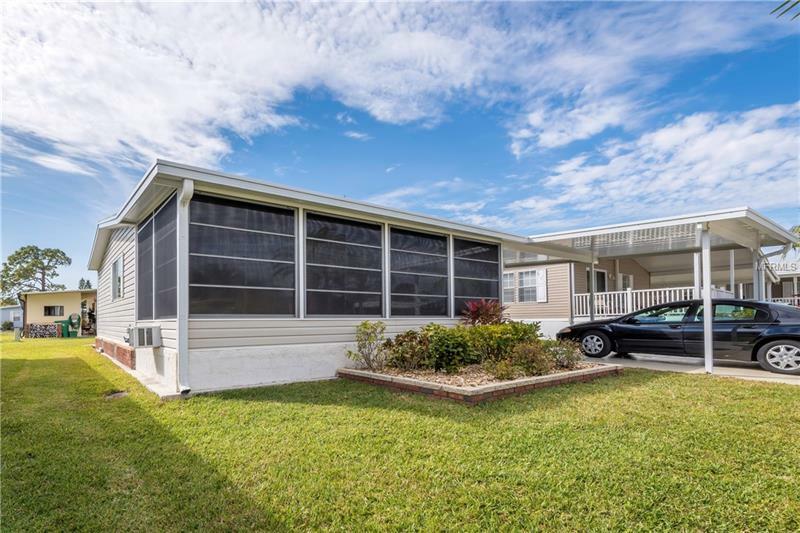 This gem has so much to offer including a split bedroom plan one enclosed lanai on the front and one screened lanai at the back plus a storage shed complete with a washer and dryer. This sweet home is super neat and clean and comes furnished PLUS a golf cart with new batteries is included. The sellers had a new air conditioner installed in October 2018. You will feel right at home the minute you step through the pocketing slider doors. Great price! Don't let it get away! Home price includes $40000 membership certificate/share. Located in an award winning resident owned 55+ gated golf course community with an active resort lifestyle. Features a par 62 18 hole golf course 5 tennis courts bocce ball lawn bowling 2 shuffleboard court centers 4 heated swimming pools 2 hot tubs fitness facility woodworking facility 75+ clubs/activities 2 pickleball courts restaurant with full service bar and more. Sorry no dog allowed at this interior lot location. Shown by appointment 24 hour gated community. Not in a flood zone and no CDD tax. It's all about the lifestyle in Maple Leaf.